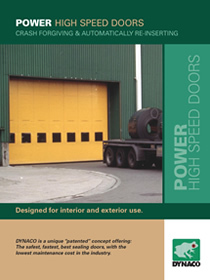 R&S offers high speed and rapid roll-up doors by Dynaco, a leader in the high-speed door industry for over 20 years. 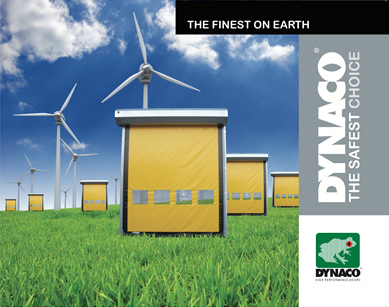 Dynaco doors are by far the most technically sound, long lasting doors in their field. Email us today for a free on site estimate or to have detailed literature mailed to you. M2 Basic: For inside and outside environments. Power M2: For inside and outside environments. All Weather M2: For outside environments exposed to high winds and other weather extremes. Stainless Steel M2: For environments requiring frequent cleaning and excellent sealing. Freezer M2 (-22 defrees F): For inside environments with extremely cold temperatures not exposed to winds. Clean Room M2: For inside environments requiring clean room class contamination control. Power M3: For inside and outside environments. All Weather M3: For outside environments exposed to high winds and other weather extremes. Slimline Food Doors: Designed for interior environments, incorporating ultra tight sealing bead technology, with ultra-clean side frame and head designs. Slimline Pharm Doors: Designed for interior pharmaceutical environments in clean room class 10,000 to 100,000. Slimline Techno Doors: Designed for interior environments, providing a high-tech, safe, and aesthetical pleasing door for even most demanding customers.